Apparently this was just another Greek Island cruise, where I think I have cruised in this region more than 10 times, but in fact it is an entirely different experience and it now ranks with the very few truly memorable cruises that I have had over almost 30 years. SeaDream, with its motto "it&apos;s yachting not cruising" ,makes all the difference, unlike what you conceive of another Greek Island voyage. Yes, I have been there too many times (and probably can count 10 ships that I have sailed with), yet in this 10-night cruise it is amazing that 6 of the 10 ports we called are my first visits! I thought I have seen all around Greek Islands ....I was wrong. This argues forcibly that only a small ship can bring about such a wonderful trip. For all these ports are tender ports: it is unthinkable if a big ship arrives, with its passengers that can be more in number than the town&apos;s whole population. The tender operation throughout all ports are immediate, no waiting, often I and just one couple take out the whole boat. I recall the chaos when tendering from a big ship (such as at Santorini). And as a matter of fact, these small discoveries (of ports) are even more beautiful than their more famous neighbors! The fact that the ship sails within a close region also means that we often arrive at 8am but leaves almost midnight. To be more specific, these ports are Spetses, Patmos, Agia Anna (Naxos), Paros, Sifnos, and Hydra, each has its own characteristics, each very beautiful in it own right, none polluted with mass tourism. Adding to these, we started from Piraeus and the voyage also covers famous names like Santorini and Mykonos,,and also Nafplion, which is not new to me but surely new to big ship cruisers. Even at the much visited Mykonos, I had the first opportunity to relish the famous night-life of it, as we sailed after midnight (the last tender back was 1 am) while all big ships invariably leave at 6 pm trying to catch the next far away port that offers a pier! While ships are cutting budgets, for example even Silversea are serving packaged juice and inferior beef, SeaDream is unchanged since my last cruise almost 3 years ago. And to my surprise many crew members not only still remember me as a return passenger, but also my dining habits. No ship (and I have been to many so-called 5-star ships) can offer this kind of service from the heart. 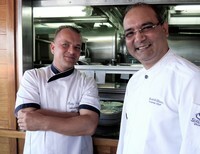 The food is simply great, again probably better than any other ships I have cruised in. I am happy that the cuisine is time-honored, and no funny fusion or molecular. In fine weather, the outdoor deck dinner under candle-light , with silverware and crystal and fine linen, bring about absolute fine dining at the best sense of the term. Caviar (in ample portion), foie ghras, and lobster are served. The deck lunch when the main course is cooked to order while the entree is self-served, offered no less than Alaska crab leg , for example, and on several cocktail occasions caviar is still free-flow. This puts most other cost-cutting so-called 5-star competitors to shame. It is these two aspects, Food and Service, that bring me back time and again, for in these no other ship can offer this level of excellence. The cabins are not spacious and not very modern compared with those on newer ships, but it is never-the-less very comfortable, offering fine linen b edding and Bulgari amenities, with impeccable house-keeping of the highest order that everyday when I come back from breakfast the room is done. Compensating for no entertainment, SeaDream offers a range of water sport activities that no other offers, thus its passengers are much younger than on similarly priced ships. These people are well-traveled and well-educated, making ship atmosphere particularly congenial. It looks that everyone parts with new friends. The ship was also able to operate with flexibility, thanks to the &apos;best captain at sea&apos;. We can reverse the order of port visits to avoid the rough sea. The captain and hotel manager greets guests on embarkation, and the Master is seen on deck on many occasions talking to guests. I hope this description amply explains why &apos;yachting&apos; is different from &apos;cruising&apos; that one comes to expect. I shall seek for the first opportunity to return, and also after this useful introduction, I also want to spend some time, maybe a few days, re-visiting my new discoveries: Naxos, Hydra, Paros.....all are simply memorable in the sense of returning to unspoilt nature. Apparently this was just another Greek Island cruise, where I think I have cruised in this region more than 10 times, but in fact it is an entirely different experience and it now ranks with the very few truly memorable cruises that I have had over almost 30 years. SeaDream, with its motto "it&apos;s yachting not cruising" ,makes all the difference, unlike what you conceive of another Greek Island voyage. Yes, I have been there too many times (and probably can count 10 ships that I have sailed with), yet in this 10-night cruise it is amazing that 6 of the 10 ports we called are my first visits! I thought I have seen all around Greek Islands ....I was wrong. This argues forcibly that only a small ship can bring about such a wonderful trip. For all these ports are tender ports: it is unthinkable if a big ship arrives, with its passengers that can be more in number than the town&apos;s whole population. The tender operation throughout all ports are immediate, no waiting, often I and just one couple take out the whole boat. I recall the chaos when tendering from a big ship (such as at Santorini). And as a matter of fact, these small discoveries (of ports) are even more beautiful than their more famous neighbors! The fact that the ship sails within a close region also means that we often arrive at 8am but leaves almost midnight. To be more specific, these ports are Spetses, Patmos, Agia Anna (Naxos), Paros, Sifnos, and Hydra, each has its own characteristics, each very beautiful in it own right, none polluted with mass tourism. Adding to these, we started from Piraeus and the voyage also covers famous names like Santorini and Mykonos,,and also Nafplion, which is not new to me but surely new to big ship cruisers. Even at the much visited Mykonos, I had the first opportunity to relish the famous night-life of it, as we sailed after midnight (the last tender back was 1 am) while all big ships invariably leave at 6 pm trying to catch the next far away port that offers a pier! While ships are cutting budgets, for example even Silversea are serving packaged juice and inferior beef, SeaDream is unchanged since my last cruise almost 3 years ago. And to my surprise many crew members not only still remember me as a return passenger, but also my dining habits. No ship (and I have been to many so-called 5-star ships) can offer this kind of service from the heart. 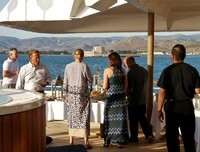 The food is simply great, again probably better than any other ships I have cruised in. I am happy that the cuisine is time-honored, and no funny fusion or molecular. In fine weather, the outdoor deck dinner under candle-light , with silverware and crystal and fine linen, bring about absolute fine dining at the best sense of the term. Caviar (in ample portion), foie ghras, and lobster are served. The deck lunch when the main course is cooked to order while the entree is self-served, offered no less than Alaska crab leg , for example, and on several cocktail occasions caviar is still free-flow. This puts most other cost-cutting so-called 5-star competitors to shame. It is these two aspects, Food and Service, that bring me back time and again, for in these no other ship can offer this level of excellence. The cabins are not spacious and not very modern compared with those on newer ships, but it is never-the-less very comfortable, offering fine linen b edding and Bulgari amenities, with impeccable house-keeping of the highest order that everyday when I come back from breakfast the room is done. Compensating for no entertainment, SeaDream offers a range of water sport activities that no other offers, thus its passengers are much younger than on similarly priced ships. These people are well-traveled and well-educated, making ship atmosphere particularly congenial. It looks that everyone parts with new friends. The ship was also able to operate with flexibility, thanks to the &apos;best captain at sea&apos;. We can reverse the order of port visits to avoid the rough sea. The captain and hotel manager greets guests on embarkation, and the Master is seen on deck on many occasions talking to guests. I hope this description amply explains why &apos;yachting&apos; is different from &apos;cruising&apos; that one comes to expect. I shall seek for the first opportunity to return, and also after this useful introduction, I also want to spend some time, maybe a few days, re-visiting my new discoveries: Naxos, Hydra, Paros.....all are simply memorable in the sense of returning to unspoilt nature.